Before you add your betta to the tank you may need to treat your well water to make it safe. Betta fish are one of the most popular fish for aquarium hobbyists, and for good reason: They come in a wide array of beautiful colors and tail shapes. Keeping a pet betta can be a rewarding experience, but if you want to keep your fish healthy, you need to start with clean water. Determine whether your well water is being pumped through a water softener before coming out the tap. If it is, tap the water for your betta aquarium from the well before it goes through the softener. Fill your betta aquarium with the appropriate amount of water and drop in a tank thermometer to check the water temperature. Set the gauge on your aquarium heater to a temperature between 72 and 82 degrees Fahrenheit. 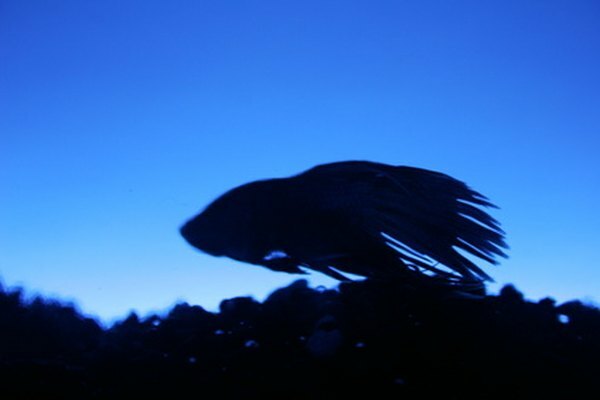 Though betta fish can adapt to higher and lower temperatures, this is their preferred range. Use an aquarium water test kit to test the water chemistry in your betta aquarium before you treat the water. The test will show you the pH level of your well water as well as the chemical content. Betta fish prefer a pH range between 6.5 and 7.5. Lower the pH in your betta tank, if necessary, by adding peat moss to your aquarium filter; or raise the pH by adding 1 teaspoon of baking soda per 10 gallons of water. Dose your betta tank with an aquarium water conditioner to remove chlorine and heavy metals. Most city tap water is treated with chlorine, but your well water may not be. Your water could still contain metals and other chemicals, however, so a water conditioner is recommended. Wait for the temperature in your betta aquarium to stabilize -- this could take as long as 24 hours. Once you have treated the water and the temperature has stabilized, it will be safe to add your bettas. What Do Baby Bettas Eat?